Linda works as a Senior Lotus Notes Analyst for Jumbalaya Doors. 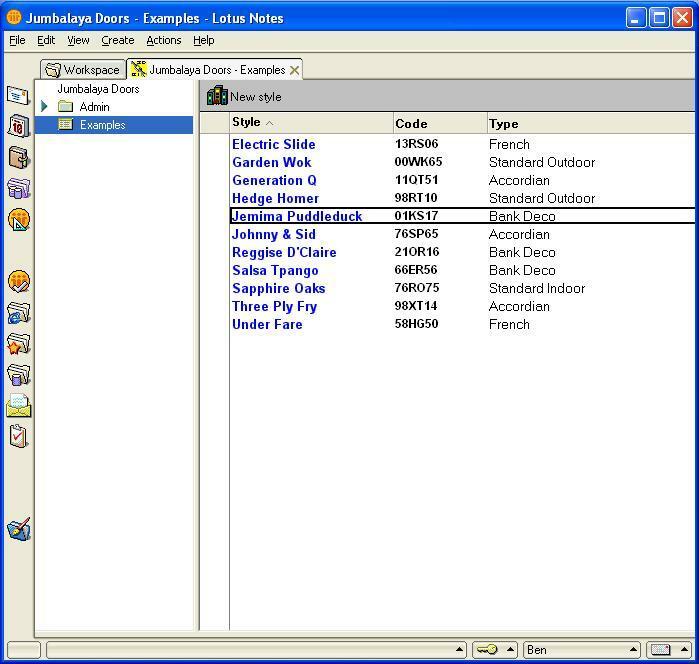 Jumbalaya has a database to keep track of different door styles. Each door style has a picture, along with related information and links. Last week, Linda was given the job of web enabling this database. At first, Linda thought the job would be pretty easy. The database was not complicated, with just a few fields. When Linda looked at the documents on the web, they looked pretty good. "Hey, this looks pretty easy! ", thought Linda. But then, Linda tried editing one of the documents. All the formatting disappeared, along with the picture of the door and the links. "The other fields are OK", she thought, "but the rich text is totally messed up!" Linda was not sure what to do. She took a walk to clear her mind. Then, she remembered that there was a Java applet available for editing rich text. Linda changed the design and opened the document in the browser. When she saw the contents of the Java applet, her hopes were dashed. "Our distributors can't handle HTML tags scattered around the rich text. Heck, even I can't figure out how to modify this." "What am I going to tell my boss?" Linda worried. Linda's boss' favorite saying was "Where there's a will, there's a way!". Linda had an idea. She called her friend Bernice, who had good news. "There is a new option called 'Best Fit for OS' which you can use for web editing." she told Linda. "I haven't had a chance to try it yet, but it sounds like it could help." Linda rushed back to the office, and found the 'Best Fit for OS' option. She tested in Internet Explorer, because Bernice had warned her that 'Best Fit for OS' wouldn't work in Firefox. Ta da! This was better. Linda tried editing, and sure enough, everything looked much better. Feeling relieved, Linda switched back to her Notes client to look at the modifications from there. But what was this? The document looked terrible. The borders were heavy, the font was wrong, the doclinks all looked broken, and the image was missing. Feeling discouraged, Linda took another walk in the park to think about what to do next. Suddenly she saw Bernice hurrying towards her. "I'm glad I ran into you. It turns out that the 'Best Fit' option messes up all kinds of things. ", Bernice told her. "But look what I found in this magazine." What Linda read looked perfect. A product called CoexEdit was supposed to make rich text editing work in both the Notes client and on the web. Linda got an evaluation copy of CoexEdit, and easily added it into her application. She restored her document from backups. "Tomorrow, we'll put CoexEdit to the test!" she thought. On her drive in, Linda was optimistic. CoexEdit certainly sounded like it might work. When she got to work, she fired up her browser and went to the database, eager to see what CoexEdit would do for her. Linda used the editor that came with CoexEdit, because it was really simple to add to her form. When she opened the editor and saw everything in the rich text field displayed the way it should be in edit mode, and even made some changes, she felt optimistic. But then she remember the bad experience with 'Best Fit for OS', so she switched to Notes to see what damage had been done. When she saw that all the content was still there and still looked right, and that even the doclinks (which had been URL links on the web) were back to being doclinks in Notes, she was so happy she practically skipped through the park. Linda finished up the database that evening. Later, over dinner with Bernice, she described how Linda's boss had reacted to the new design. "When he saw how well it worked, he authorized an immediate purchase for CoexEdit... and asked if I could start web enabling the Sales and Invoice databases on Monday!"